A camel crossing sign looms ahead through the bus window. Bedouins herd their goats. Yes, she has some tough neighbors. Syria sits to her north; Iraq is to her east. While it discourages a lot of people from visiting Jordan, it shouldn’t. The Jordanians are some of the nicest, most giving, generous people you’ll ever meet. Literally they cannot do enough for you. And they are proud to introduce you to the natural and man-made marvels of their country, and their astounding heritage. Few small countries can boast of so much to see. On Mt. Nebo one can stand where Moses once stood, looking out over the Promised Land. Christian tradition holds that Moses is buried on this mountain. While walking here it’s hard not to wonder if you are quite literally stepping in the footprint of Moses. While Jordan is composed mainly of desert, it’s not the picture of a desert that I’ve always carried in my head. Endless, rolling sand dunes with perhaps some scrub vegetation was what I expected. Instead, the sand of the Wadi (meaning valley) Rum desert does not stretch endlessly across the horizon, but is constantly interrupted by massive, and intriguingly structured, rock formations. Wadi Rum is the former haunt of T.E. Lawrence (Lawrence of Arabia), an author, diplomat, archaeologist and military advisor renown for his role as a liaison in the Arab revolt against the Ottoman Empire in World War I. One of the most prominent rock formations in Wadi Rum is named after Lawrence’s book The Seven Pillars of Wisdom. We took jeeps through the valley, and as we ventured deeper into the Wadi Rum, I wouldn’t have been too surprised to see Lawrence come galloping out from behind a sandstone cliff. Stopping for tea with some Bedouins, we enjoyed the shade of their tent, some delicious cinnamon tea, and time playing with their new kittens. Outside of Amman, we stayed at a hotel on The Dead Sea, at 1400 feet below sea level the lowest point on earth. If you feel particularly energetic and happy there, there is a reason beyond the beauty of the region. The oxygen at this point is extremely rich, quite the opposite of what you would experience on a mountaintop. Famous for its healing properties, the Dead Sea is ten times saltier than any other sea, and rich in minerals including magnesium and potassium. The sun, salt, and minerals help relieve psoriasis, arthritis and asthma. But it’s not just for people seeking relief from vexing physical conditions. Soaking in the buoyant, mineral rich waters is relaxing, and once you’re in it you don’t want to get out. Well, actually, you can’t get out. The buoyancy is so strong that it is literally difficult to get your legs back underneath you! Between the relaxing soak and the exhilarating rich air, the Dead Sea beats any spa for making you feel like a whole new you. Jordan is famous for her mosaics, the components of which are drawn from the rocks covering much of her landscape. This rock face can contain such a variety of colors and shades, from turquoises to pinks and reds to green…and beyond, that those who create the stunning mosaics have no need to dye the rock pieces they use. Any color they want is naturally at their disposal. Traditional Middle Eastern fare is at its best in Jordan. “Mezze,” the traditional small plate meals, will knock your socks out for the flavor and variety of the dishes. Hummus of course seems to be part of every meal. Falafel, fried chickpea flour with Middle Eastern spices can be munches with veggies, dipped in moutabel (roasted, pureed eggplant with garlic). A huge pile of red-ripe watermelon slices is the perfect finish to the meal. Just don’t eat in your hotel. We went to Jordan on a tour, and stayed in a chain. The food was notoriously institutional so we grabbed a meal while out whenever possible. 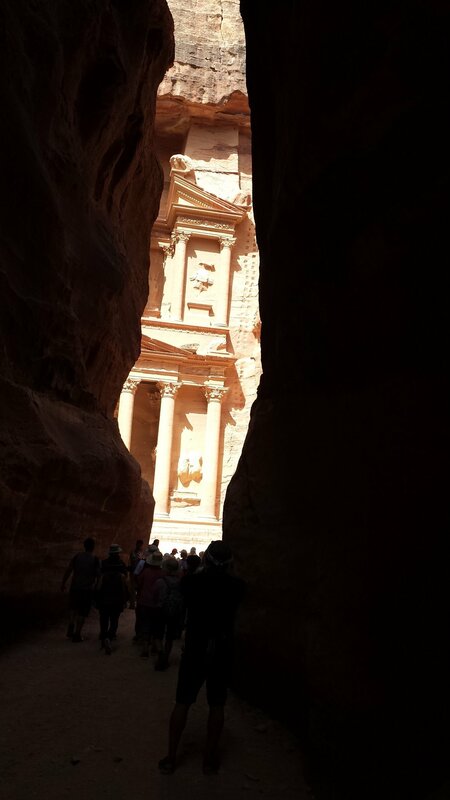 Of course, the most well-known attraction in Jordan is Petra, and it’s all you have ever imagined, and more. The city, carved into sandstone cliffs by the ancient Nabateans, astounds visitors for its beauty, ingenuity, and sheer audacity. Forget building a city. They carved one! Named a UNESCO World Heritage site in 1985, Petra (meaning “rock” in Greek) dates back at least 2000 years. While it lay hidden from the outside world for centuries, it was rediscovered in 1812 by a Swiss named Johann Burckhardt. 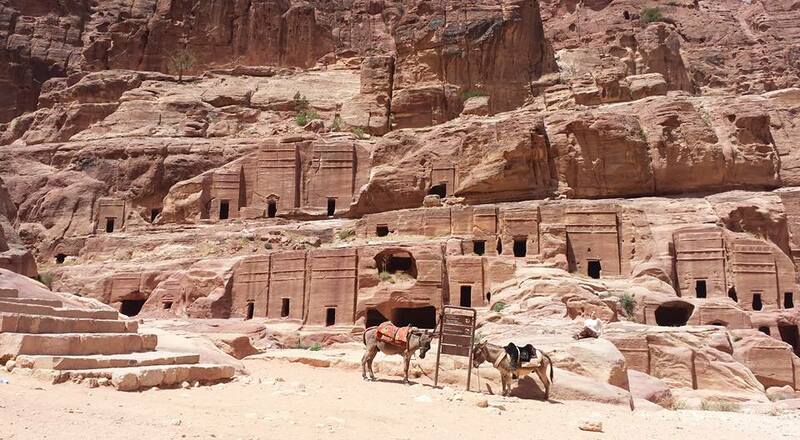 Petra now draws seven million visitors annually. The Nabatean empire spanned parts of Jordan, Egypt, Syria, Israel, and Saudi Arabia, which explains the variety of styles reflected in the architecture of the carvings. Greek, Roman, Egyptian, Indian and Assyrian influences can all be found. Called the richest race on earth by the Roman writer Pliny, the Nabateans traded in frankincense, myrrh and other incense and spices. During that period, incense was used in most religious ceremonies, and in burial rites. Trading in frankincense and myrrh was the equivalent of holding the Apple patent today, and Petra was right at the heart of the “incense road,” intersecting all the main trade routes leading to Egypt, China, Greece, Rome, and beyond. From this vantage point the Nabateans amassed fortunes. As many Christmas carols tell us, frankincense and myrrh were given by the Three Wise Men to the baby Jesus. Not only were they valuable for religious purposes, but they had curative benefits as well, so they weren’t such an odd baby gift after all. The city was named Petra, the “Rose City,” because of the color of its sandstone walls. Sandstone is a soft, compressed stone composed of sand and minerals. Although it is considered “easily” carved, it is still unimaginable to think of the hundreds of workers and the amount of time it must have taken to carve an entire city. Master hydraulic engineers, the Nabateans figured out how to provide water for a desert area that receives an average of only six inches of water a year and housed 20,000 to 30,000 people. Every nearby spring was tapped and channeled across mountains and through gorges, into cisterns. Channels were carved into the sides of canyons at just the right degree of descent so that water neither stopped flowing nor flooded the valley. Dams were constructed to protect the inhabitants from frequent flash floods. The system showed such sophistication that scientists are hard pressed to replicate their feats today. And this, mind you, was back before Jesus walked the earth. Standing nearly 120 feet high (twice the height of Mt. Rushmore), this icon of Petra will sear itself forever in your mind and your soul. Reaching The Treasury requires a mile-long hike down a twisting canyon, the Siq (meaning “the passage”). With walls ranging as high as 600 feet, water channels and carvings and remnants of statues in its sides, the Siq is fascinating in itself. But any Indiana Jones fan knows it is what’s at the end that matters most. Our guide, Ahmed, made sure that our first glimpse of The Treasury will never be forgotten. He planned our trip down perfectly, including what time we went to Petra so as to get the best view of The Treasury. As we neared the end of the Siq, he had us all stop, and then instructed us to close our eyes and put our hands on the shoulders of the person before us. We inched forward until he guided us to a stop. Only then could we open our eyes. Pow! A sliver of the massive edifice, framed between the walls of the Siq, dazzled us in the bright morning light. A sublime surge of emotion swept over us as we feasted our eyes on one of the world’s most wondrous sites. This was it, The Treasury that we’ve heard about, read about, and seen in photos, and of course, in Indiana Jones and the Last Crusade. While photos and movies were fascinating and provided some idea of what was to come, reality was breathtaking, one of those moments in travel, or in life, that will forever be etched in your consciousness. And it all looked most likely as it would have 2000 years ago, when traders from around the globe saw it hundreds of years before Christ. Bedouins, camels, Arabian horses, and donkeys milled around the center square. Merchants displayed their keffiyeh (the headdress worn by men), their tea, their frankincense and myrrh. Bring a hat, sunscreen, and plenty of water. When we were in May it was an unseasonably hot 116 degrees. Yes it is a dry heat, and it is different. In the shade it’s not too bad. But in the sun it feels as though you are being baked. Wear walking shoes. It’s quite a hike down the canyon to get to the city, explore it, and then walk back where it’s uphill all the way. But there are always horse carts, donkeys or camels to transport you back if you’re just too tired. The Jordanians are incredibly hospitable, kind people, and will do everything they can to insure you have the best possible time exploring Petra. Still, there are always people at any tourist attraction who will try to fleece you. A good guide will let you know who is selling the real deal and who to stay away from. Have a great time. Petra is one of the wonders of the world, and seeing it in person is a joy that you will never forget.